Jump start a car &#8211; the step by step guide to follow! Jump start a car – the step by step guide to follow! A dead battery can often be revived with a jump start. You just need to know how. For the assistant as well as the driver of the broken down vehicle, it is therefore useful to know what to do in this case. According to ADAC breakdown statistics, up to 40% of all breakdowns are caused by poorly maintained batteries. If the battery capacity falls below a critical level, it cannot supply the car’s electrical components with sufficient power. Often as a last resort jump starting with the aid of a jumper cable can get the vehicle started. The good news for all concerned: To jump start a car with a discharged battery, in addition to an assisting vehicle with a working battery, only a jump start cable is required. Important: The diameter of the cable should be at least 16 mm. For cars with large engines, a jump start cable with a cross section of 25 mm is recommended. The vehicle which has suffered a breakdown must be supplied by a battery with the same voltage. Normally, the voltage of most vehicles is 12 Volts. Only a few vintage cars are operated with a voltage of 6 Volts. In all cases, please observe the information in the operating manuals of both vehicles. Both vehicles must be parked on level ground and secured. The assisting and the broken down vehicle must not touch, as otherwise there is a risk of a short circuit. 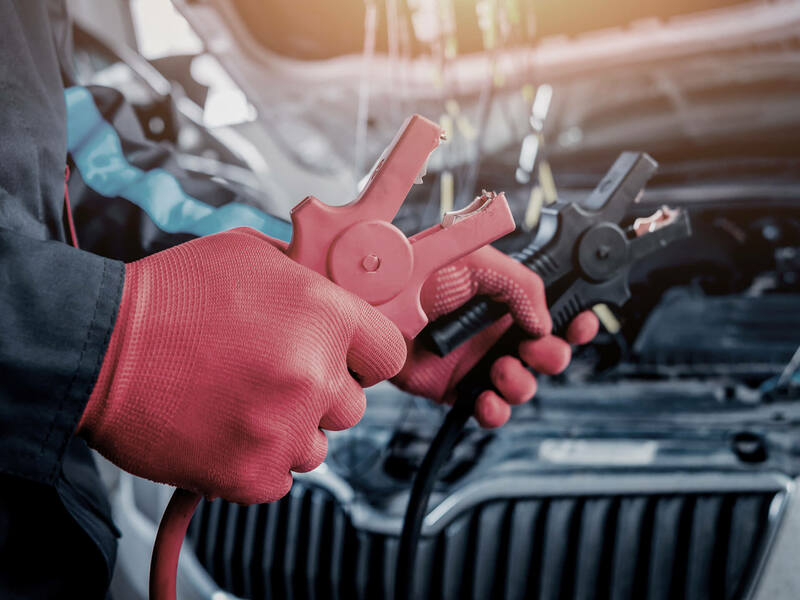 In many new vehicles the battery is no longer located in the engine compartment, but the positive and negative terminals can usually be found quickly. If necessary, a look at the operating instructions can be helpful. The engines of both vehicles must be switched off. Important: Many modern cars, in which the battery is not located under the bonnet have “jump start” connections in the engine compartment, which must be used. In this case the jump start cable must not be connected directly to the battery. The jump start cable must only be held by the insulated plastic handles. Important: The red cable is always connected to the positive terminal and the black cable to the negative terminal. First the clamp of the red cable is connected to the positive terminal of the assisting vehicle. The other end of the red cable is connected to the positive terminal of the broken down vehicle. Then the black clamp is connected to the negative terminal of the assisting battery. Important: Under no circumstances should the other end of the black cable be connected to the negative terminal, but rather to the body of the broken down vehicle. For this, a strong, unpainted metal component in the engine compartment of the vehicle, for example the engine block, is suitable. Connection directly to the negative terminal of the broken down vehicle is not recommended, as this can cause sparking, which can damage the battery. In the case of old lead-acid batteries, there may even be an escape of battery acid, which could endanger people in the vicinity. There is also a risk that hydrogen could ignite, so it is advisable to wear protective glasses. Important: First start the engine of the assisting vehicle and then the engine of the broken down vehicle. If starting is successful, an electrical consumer such as the headlights or the rear window heater should be switched on in the broken down vehicle. This avoids voltage surges when disconnecting the clamps from the terminals. Removal of the cable clamps is carried out in the reverse sequence. A long journey is recommended in order to quickly recharge the battery. An alternative is to connect the battery to a charger. You should visit a workshop after all cases of deep discharge in order to investigate the reason for the failure. In the case of a battery which is weak due to old age, jump starting is only a very temporary remedy and the problem may recur with the next attempt to start. If a large number of electrical consumers were the reason for the discharge of a battery which is otherwise OK, it is worth visiting a workshop, as the power reduction due to the loss of active material is permanent. Jump starting fails – now what? If the car does not start, or stalls immediately, you should wait for about a minute before the next jump start attempt. If jump starting is still not successful, the cause is often a damaged or unsuitable jumper cable. In this case, an attempt with a suitable or intact jumper cable is a possible solution. A good alternative to conventional jumper cables is the use of a start booster. Start boosters are portable lithium-ion batteries with an integrated jumper cable. Connection of the cable clamps is identical to the connection of a jumper cable. Important: Even a start booster quickly looses capacity at winter temperatures, so the start booster should not be kept in the car at sub-zero temperatures. The battery is the car’s electrical power plant. It obtains its power from the electro-chemical potential of two galvanic cells. If the anode (negative terminal) and the cathode (positive terminal) of the car battery are connected to form a circuit, electrical components such as headlights and the starter can be operated. Due to the large number of electrical consumers in modern cars, car batteries now have to deliver more power than they did previously. Batteries which are suitable for start-stop technology are more robust than old-type lead-acid batteries, but even so, at some point they reach the end of their useful life. As well as this, all car batteries suffer from the effect of self-discharge, so that you should ensure that all electrical consumers are really switched off or disconnected for long standstill times. If the battery condition is not checked at regular intervals, there is a risk of failure at the wrong time. You can read about the possible reasons why the car will not start. A battery check in the course of the normal service is advisable. This enables poor performance and damage to be detected at an early stage. The reliability and useful life of a battery can be increased by regularly charging the battery with a charger during the winter. How to care for car batteries properly.